Monday, February 27th, 2012 | Author: Bunco Betty! The ideas were so cute! I also wanted to share a picture of some cupcakes that someone made for an American Cancer Society fundraiser. She did a fab job and they raised almost $500.00! Way to go!! They look yummy!! Here’s another online recipe I thought sounded good…baked, not fried! Yay! Cut cheese in 1/2″ x 1/2″ x 3″ sticks. Toss with flour and set aside. In small bowl, beat together eggs and water and set aside. In separate bowl, combine bread crumbs, italian seasoning and garlic powder. Dip sticks in egg mixture, then coat with crumbs. Place on a plate in a single layer, cover with foil and chill for 2 hours. Place cheese sticks on an aluminum foil lined baking sheet and drizzle with melted butter. Bake until crisp, about 8 to 10 minutes.Flip after 5 minutes. Heat a little spaghetti sauce to use for dipping. Until next time Bunco Babes!! Friday, February 17th, 2012 | Author: Bunco Betty! 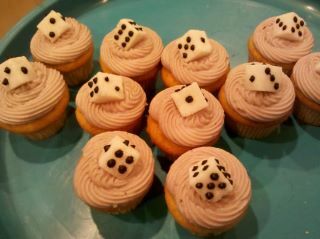 Ok, so I’m going to do a “My favorite bunco things” post! First, I shall share with you some of the great sales we are having currently and I promise you will love them! All under $10.00!! I could keep going, but I will fill up the entire page with just sales! Check it out at Bunco Game Shop! Things have been going pretty well. My daughter loves her Gymnastics class and I love watching her! When I was a little girl that’s all I ever dreamed of but my parents couldn’t afford it. Work has been going good too! And guess what?? My dear friend won an all expense paid trip to Wendover Nevada for 3 nights on a radio station and she’s taking me! WhooHoo! Mommies weekend getaway here we come! The trip included the round trip flights for 2 and 3 nights at a casino. It’s going to be so much fun! 3 nights without kids! Sounds like a great getaway! It’s the first weekend of March, so I’m saving my money! Anyone been there? I haven’t been to Wendover Nevada…I guess it’s on the border of Nevada and Utah. Until next time my bunco divas! Monday, February 06th, 2012 | Author: Bunco Betty! I can’t believe it’s already February!!!! Everyone always said that when your kids are young, the time flies by so fast and that is SO true! 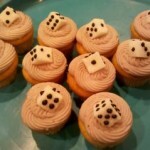 If you want some Feb & March ideas for your Bunco party, you can check some out here. Also, I have been getting into the appetizer craze and my friend made one for Superbowl Sunday and it was YUMMY!! Preheat oven to 400F and prepare two baking sheets with either parchment paper or spray them well with cooking spray. Thaw one large square of puffed pastry for about 10 minutes. Flour your counter top or working surface and roll out the pastry square as thinly as possible. With a pizza cutter or knife, slice the puffed pastry into approximately 2-inch by 2-inch squares. On half the squares place a dollop of avocado, then cream cheese, then salsa, season with salt and pepper. Use the remaining squares as the lids and place one lid over the filling mounds. Seal the pastry by pressing the edges with a fork, taking care to seal the edges well, pressing the fork in repeatedly, so no filling escapes during baking. In a small bowl, beat an egg with a fork, and apply to each of the pastry packages. Bake for 15 to 20 minutes, or until desired browning and puffing has occurred. Watch them closely after 10 minutes in case your oven is hotter or your brand of puffed pastry cooks faster. Remove from the oven and serve. Store leftovers in an airtight container in the refrigerator and if desired, reheat leftovers in the microwave for approximately 45 seconds before serving. So good and they were a hit! Lots of hugs to you bunco babes! !